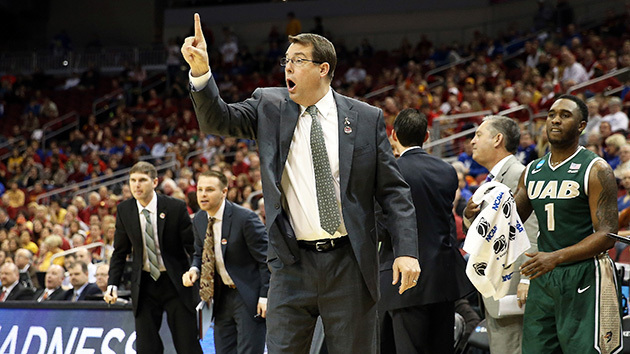 New Stanford coach Jerod Haase discusses his playing days at Cal and Kansas and his coaching stops at UNC and UAB. With the 2016 college basketball coaching carousel nearing its conclusion, SI.com is checking in with all the major hires about their new gigs. These Q&As will be posted periodically throughout April and May. Next up is Jerod Haase, who spent four seasons as UAB’s head coach before leaving for the same post at Stanford on March 25. 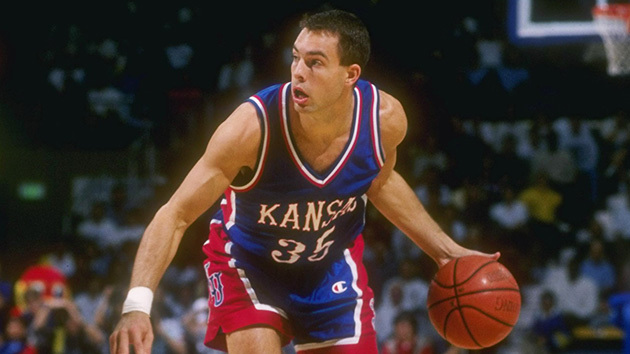 Haase, 42, led the Blazers to an 80–53 record, a winning percentage of 60.2% and an NCAA tournament upset win No. 3 seed Iowa State in 2015. He is married and has three children. This interview took place on April 22. Sports Illustrated: Where are you in the moving process? Still living out of a hotel? Jerod Haase: I’m living out of multiple hotels. I started calculating last night, and I think I’ve been on 19 different airplanes since I got the job. I’ve been in a hotel every night during that time. I think I was in Birmingham two of those nights, but it’s been a whirlwind. SI: Were most of the flights back and forth between Birmingham and Stanford, or mostly recruiting? JH: A lot of recruiting. I think it was 11 different states. I’ve been to the East Coast a few times, been to the Midwest, been to the South. It’s been wild. SI: Have you been racking up the frequent flyer miles? JH: I hope so. Hopefully we can get a vacation for the family at some point. The Marriott points will come in handy. SI: I wanted to start by going back to high school for you. Stanford was one of the first schools that showed interest in you as a player, but you ended up choosing Cal. I’m surprised you were even considered for the job. JH: (Laughs.) Well I blame [former Stanford] coach [Mike] Montgomery for that one. I told him I’m going to throw him under the bus every opportunity I get. My dream was to go to Stanford, but I never got the formal offer. I had to make some adjustments, so I ended up going to Cal. SI: Were you a Stanford fan growing up? Did you have a college basketball team? JH: I didn’t really have a favorite team. Once I got into high school, I had a great appreciation for what coach Montgomery and what the Stanford program was doing. When I realized that I might be a Division-I basketball player, I started thinking in my mind that Stanford might be the place I wanted to be. SI: And you have four brothers and sisters who played college sports. Are any of them still involved in the sports world? JH: No, none of them. I’m the lone survivor. Two of them were in the military, so that trumped the sports aspect. SI: You transferred and played for Roy Williams at Kansas. Then you transitioned to coaching pretty quickly after college. Was it something that you knew you’d wanted to do even as a player? JH: I knew I had an interest, but I was never the guy that dreamed since I was 5 years old that I wanted to be a coach. But I knew that it intrigued me. I went overseas and played for a couple months and realized that I no longer had a passion for playing but still loved the game of basketball. And when I was over there I decided I want to give it a try. But I didn’t get my foot in the door for a couple years with coach at Kansas. During those couple years, I tried to be an entrepreneur. I wrote a book and did a couple of videos and got my master’s degree and did lots of fun stuff. SI: The book is named after a stat, Floor Burns, that was started because of you at Kansas. What did that track? ​JH: I think technically it was how many times you hit the ground, like if you took a charge or dove for a loose ball. I think, though I’m not positive, that Kansas still keeps it. I feel pretty proud that a stat was kind of named after me and it stuck all these years. Again, I’m not positive that they keep it, but it would be pretty cool if they did. SI: Does Roy Williams use it at North Carolina? JH: I don’t believe so. SI: Will you keep it at Stanford? Have you done it at UAB? JH: I didn’t do at UAB, but I’m strongly considering doing it here. As we develop the culture of the program, that’s going to be a necessary thing. SI: What were some things that you learned from Roy as a player and as a coach? JH: Well the biggest thing is that he treats everybody so well, and I’ve always had a great relationship with coach. When I transitioned from playing for him to working for him, there wasn’t a lot of difference. I think he’s always been great with the assistant coaches. He doesn’t micromanage. He expects everybody to do their job and to be competent and effective with it. But you have a different perspective when you’re a coach and you’re trying to provide feedback. Realistically, there wasn’t a huge change. I had a great relationship as a player and then as a coach it continued. 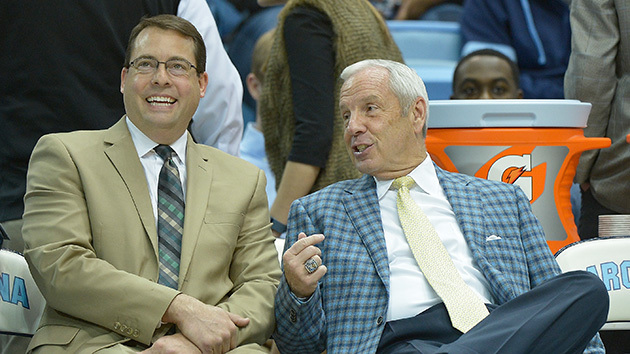 SI: Do you have a standout Roy Williams story? JH: There’s probably a ton. I’m trying to think of one, but the biggest thing for me is the overall relationship. Anytime there’s an important decision to make, an important thing going on, I’m always calling him first to get his opinion and feedback on everything. The Stanford job was no exception. SI: What did he say to you about it? JH: He was great. He said the things that I said, which is that I felt it was a great fit. And that’s something I talk about all the time in recruiting, as I’ve done it here. You have to find the school that fits you and that you fit there. With Stanford, I really felt like I was a good fit, and I was able to convince them of the same thing. SI: It speaks pretty highly of your relationship with Roy that he would take time out to offer you advice during the middle of an NCAA tournament run. JH: Well, and beyond that, it’s not just talking to me about that, it’s making phone calls. It’s not just a two-minute conversation with me. He does all he can to assist. He’s absolutely phenomenal. That’s probably the biggest reason I got into coaching. My dream is to have relationships with my players and my former players similar to what Coach Williams has with his players. The way I look at him and respect him—the dream scenario is that someday my players look at me the same way. SI: When you were with him at Carolina, you spent some time coaching the JV team there. What did you learn from that experience? There’s a strong history and tradition particularly with that team at UNC. JH: Yeah, it’s phenomenal. Being with coach Williams at Carolina, and especially running the JV team, I felt like I learned how to run a program from top to bottom. When I took over at UAB, there were very few times when I was shocked or not prepared. It doesn’t mean I made all the right decisions or did the perfect things, but I felt prepared, and I think that’s a credit to coach Williams. I remember very clearly, with the JV team, the very first time I called a timeout. And I looked around for coach Williams or someone to hand the clipboard to, and I realized very quickly it was my responsibility to talk to the team. There certainly is an adjustment to being the head coach, and the JV team provides you an opportunity to work through those things and work through mistakes and develop your brand and style. It’s an unbelievable thing. SI: Was that actively part of the plan to become a head coach one day? ​JH: Absolutely, it was the end goal. There were two goals. One was to enjoy the experience and make sure the student-athletes had a great time. But selfishly it was 100% trying to prepare me for the future. The dream was to become a head coach. And I think the JV experience unquestionably helped prepare me. I’m sure that coach Williams would say the same thing from when he was the head coach a long time ago. SI: Now I’m sure there were still some things that surprised you as you took over at UAB. It’s a different caliber of program from UNC to UAB. JH: The hardest part for me was just the gameday stress. I felt so prepared in so many ways, but when you’re the head coach—for me, anyway—the stress levels were very hard to deal with. But I’ve slowly grown and figured out how to deal with that. But that was the biggest adjustment. As a player, you get nervous energy, but you can get out there and get after it and lose that fairly quickly. As an assistant, it’s a different feeling. You’re certainly invested, but as a head coach the pressure levels and stress are a surreal thing. SI: How do you deal with the stress now? JH: I’ve done a lot of different things. I’ve tried just about everything, and I feel like I’ve progressed in a lot of different ways. Everything from working out to visiting with different people. I don’t think there’s a magic pill that makes everything better, but I think comprehensively—from working out to thinking through the big picture—I think I’ve improved. SI: Does the nervous energy get bigger in the NCAA tournament? JH: You know what, not necessarily. In some ways, it was even less there. And it’s one of those things, just candidly, that’s hard to put my finger on, where the stress comes from. Different games, it’s a different feeling. But the NCAA tournament, when we were there, my stress levels were kind of low. It was actually just kind of a fun deal. SI: Is some of that that when you’re in a mid-major school, you’re kind of playing with house money when you get to the tournament? JH: I think there’s certainly a sense of that. At that point, we had accomplished so much and we were playing very confidently. It was just a fun team to coach, and I think there was a great deal of confidence going in there. JH: Well I can honestly say, and I mean this sincerely—I wasn’t looking. The quality of life in Birmingham—my wife and kids and I were so unbelievably happy. And the program was as healthy as can be. The best days are still ahead there. It wasn’t something that we were thinking, let’s go to greener pastures, because the pastures are pretty darn green in Birmingham. But I remember when the job came open, I looked over at my wife, and I kind of said, “Uh-oh.” And she said, “What?” And I said, “This is the one. Stanford is the one. That’s the dream scenario.” She kind of rolled her eyes and understood it was going to be important to me. I didn’t know if I could get involved with it or not, but luckily I had a chance. SI: Does your wife have California experience, other than visiting your family? Did she want to leave Birmingham? ​JH: She was so comfortable in Birmingham that she never really spent time in California or the Bay Area, but I know her and the kids and they’re going to love it. But you know it’s just, you have to sell the house and move and find new friends and a new school—it’s a challenging time. SI: Who in your family still lives in California? JH: I have a sister and her family up in Lake Tahoe, and my mom lives up there. And then we have a lot of extended family in northern California as well. SI: How big of a pull was family? JH: I probably shouldn’t say this—my mom will probably get mad—but it wasn’t a factor in the decision at all. But it was a really nice benefit. I didn’t say to myself, this is my chance to get back to California. This was about the opportunity to coach at Stanford. SI: Moving back to basketball, how do you handle the transition from a mid-major school to the Pac-12? This is a league that put as many teams into the NCAA tournament as the ACC this season. JH: My candid answer is that I don’t know yet. There will be a lot of adjustments. I do have an appreciation for how strong the Pac-12 is, for how good the coaches are and for the challenges that lie ahead. But like you said, to put those teams in the tournament this year was phenomenal. I think there will be an opportunity for the conference to continue to grow. SI: As you were hitting the road so heavily, how did you feel how the Stanford brand was carrying across the country? JH: It’s a national brand. It’s as strong as an academic brand as there is in the world. And so the kids we’re recruiting are going to be high-achievers, and academics are going to be a priority. When we call kids, it’s unbelievable to hear the excitement in their voice. Getting recruited by Stanford is a big deal. The academic piece is going to sell itself, but my goal is to build relationships and show that the basketball piece can be a big positive. ​SI: You’ve got some great competition in the Pac-12 for recruits from Sean Miller at Arizona to Cuonzo Martin at Cal making a big splash in recruiting. How do you make sure that Stanford is in competition for top recruits? JH: Well, I think it’s: Work and build relationship. I don’t think there’s a secret formula to it. When I went to UAB, I didn’t hire anyone from my staff with Alabama connections. And yet now half the team or more than half the team is from there. And it just started from scratch. That’s going to be our approach here. We’re going to be hard-working and honest and try to build relationships with high school coaches and players and families. SI: As you look at the roster that you have now, who do you see as foundational players? JH: I think the frontcourt has a chance to be awfully good. [Senior forward] Rosco Allen has his name in the NBA draft right now and he’ll go through that process but still has the opportunity to return, and he was a big-time player last year. [Sophomore forward] Reid Travis is phenomenal. [Sophomore forward] Michael Humphrey is phenomenal. There are a lot of guys with a ton of talent. [Freshman guard] Marcus Sheffield and [sophomore guard] Dorian Pickens on the wings—I mean this is a great program. I talked to [former] coach [Johnny] Dawkins when we were out recruiting, and the program is very healthy. SI: When did you talk with him? JH: It was this last weekend out recruiting. He already has the Central Florida job, and I have this. So we visited for a little bit. He’s a good person. And that’s one thing that he said about Stanford and that I’ve already realized—there are plenty of good people around.